Abell 68, pictured in this stunning space wallpaper here in infrared light, is a galaxy cluster. Abell 68, pictured in this stunning space wallpaper here in infrared light, is a galaxy cluster. The effect of its gravity on light means it boosts Hubble’s power, greatly increasing’the telescopes ability to observe distant and faint objects. 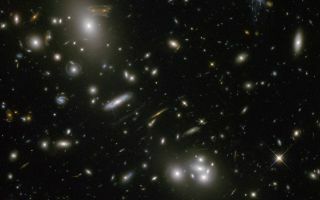 The fuzzy collection of blobs in the middle and upper left of the image is a swarm of galaxies, each with hundreds of billions of stars and vast amounts of dark matter. Distorted shapes visible throughout the field of view are distant galaxies whose light has been bent and amplified by the cluster. Image released March 5, 2013.